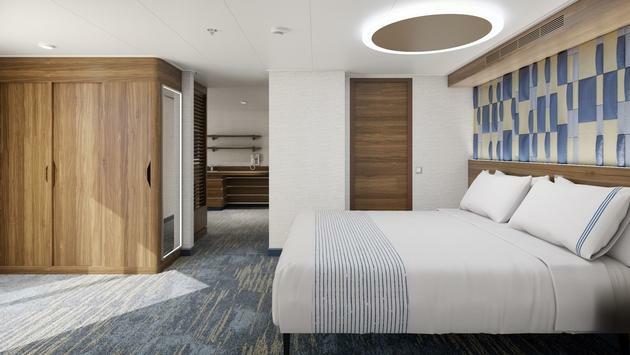 Mainstream cruise operator Carnival Cruise Lines will feature an expanded selection of premium accommodation options aboard 5,200-passenger Mardi Gras, scheduled to debut in August 2020. The new ship will offer more than 180 suites in 11 individual styles, including a new premium category, Carnival Excel suites, which will offer passengers exclusive amenities and access to Loft 19, a “resort-style, open-air enclave,” said company officials. Mardi Gras’ premium suite level will feature two Carnival Excel Presidential suites on deck 17, with large living, dining and sleeping areas and balconies, plus sunbed and lounging areas, and private outdoor hot tubs and showers. The suites also include access to the spa’s thermal suite and Havana pool area. 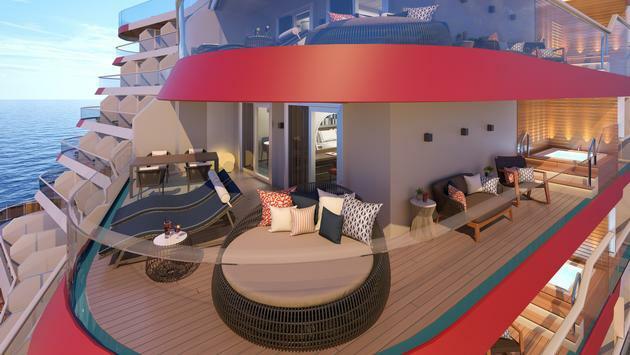 Twelve Carnival Excel Aft suites will offer separate living rooms and bedrooms, large wrap-around balconies, and private outdoor hot tubs and areas for al fresco dining and relaxing. Another dozen Carnival Excel Corner suites, on the ship’s port and starboard sides, will feature separate sleeping and lounging areas, a wet bar and wrap-around balconies with lounging and dining areas. “As we continue to announce details on Mardi Gras, guests will see that this ship is going to have more choices to stay and more choices to play,” said Christine Duffy, president of Carnival Cruise Line. Guests in all Mardi Gras suites will receive amenities packages including priority boarding and debarkation, priority main dining room seating, bathrobes and bottled water upon arrival. Guests in the 32 Carnival Excel suites will receive standard suite amenities plus unlimited access to Loft 19, a dedicated concierge phone line, guaranteed specialty dining times, complimentary soda package, room service and laundry, sparkling wine and fresh fruit basket upon arrival and upgraded bathroom amenities. Loft 19 will be located on Mardi Gras’ highest deck and offer guests a secluded retreat featuring full bar service, a private pool surrounded by sun loungers and spacious cabanas which guests can reserve. Cabanas will be stocked with beverages, robes and chilled towels, fresh fruit, lunch delivery and concierge service. Carnival Excel suite guests will receive priority when reserving Loft 19 cabanas. Mardi Gras will also feature Family Feud Live as an onboard entertainment program through a partnership with the distributor of the long-running television game show. The onboard show will feature the TV show’s format and signature set, with two five-person teams battle it out to name the most popular answers to survey questions. The first episode aired in 1976 and featured actor Richard Dawson as host. The syndicated version features entertainer Steve Harvey and host and has more than eight million viewers. In 2015 Family Feud surpassed "Wheel of Fortune" as America’s most-watched syndicated TV game show, according to Variety. Currently under construction at the Meyer Turku shipyard in Turku, Finland, Mardi Gras is slated to enter service in Europe on August 31, 2020. 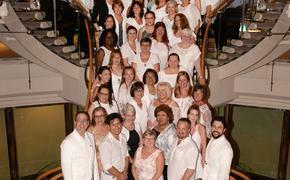 The ship will then reposition to New York for a series of voyages before continuing to Port Canaveral for year-round seven-day Caribbean cruises beginning in October 2020.